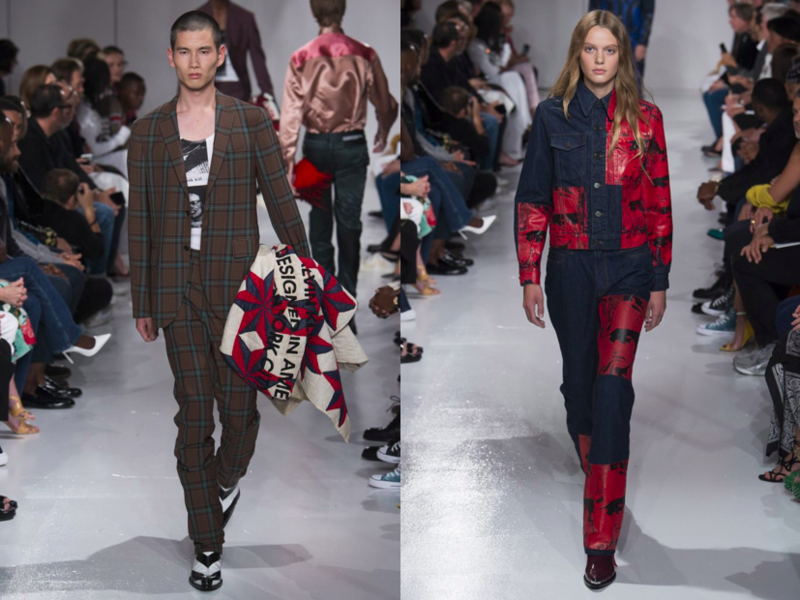 First thing you notice in Raf Simons‘ spring-summer 2018 collection for Calvin Klein is that he’s the man of consistency. 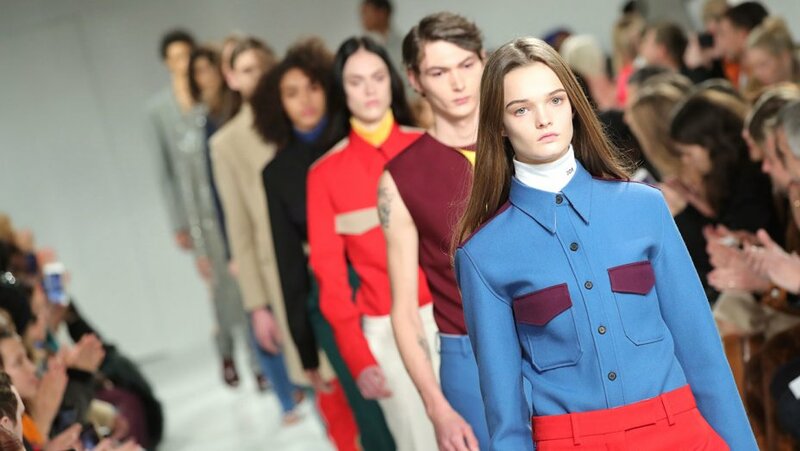 The first looks – the new CK uniforms – were the cowboy shirts in heavy colour block, the same as we’ve seen in his debut collection last March. That said, the shoes in the collection have not changed dramatically either. The venue took place in Calvin Klein’s headquarters and it was again covered with Sterling Ruby’s installations, but the main motif was actually quite disturbing- knife and blood. Were horrors and criminals on Simons’ mind for Fall? At Klein, he’s a fan for American symbolism, and thrillers are very well rooted in American cinema – wherever we speak of mid-20th century or 2017. To grasp the idea of crime-drenched drama in his new season evening wear, he pulled off 50s looking ball gowns (surprisingly constructed using vinyl). Some of the leather coats looked as if they were blood-stained, which gave the audience a thrill. 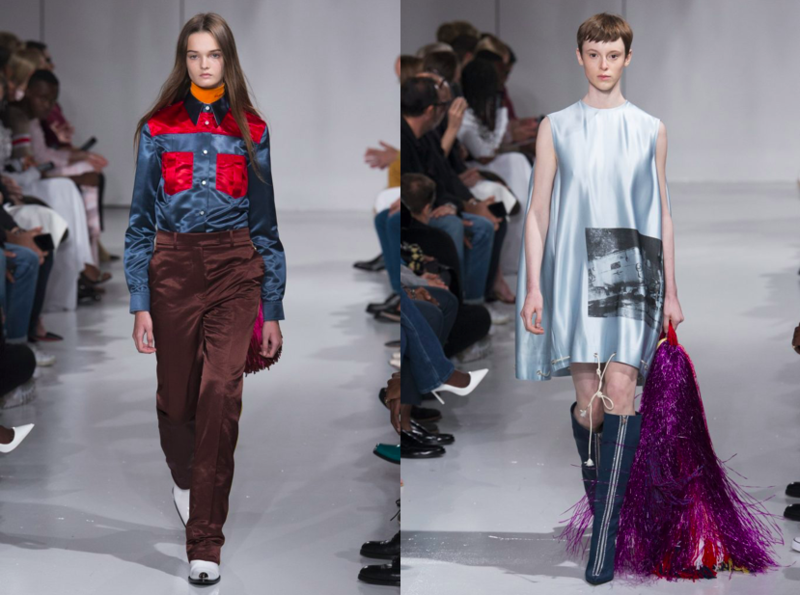 Horror film vibes got even more serious when latex gloves emerged down the runway – the high fashion reminiscent of Jason’s mask from Friday 13th, some noted. But that wasn’t the end of the American obsession. For this season, the brand collaborated with Andy Warhol Foundation on prints, using some of the lesser known elements of the artist’s works on trousers, t-shirts and dresses. Simons shakes things up again, in a very sinister (even as for him) manner. This entry was posted in New York, Trend Reports and tagged Calvin Klein, nyfw, Raf Simons, Spring 2018. Bookmark the permalink.